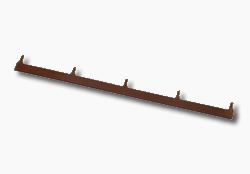 Copper Bus Bars — International Etching, Inc.
Copper Bus Bars, or board stiffeners, are another example of a product type ideally suited to chemical machining. They can be tabbed on sheets and interdigitated for maximum yield. Sheets can then be plated (usually tin or tin-lead) and then clipped out of the sheet of metal with minimal damage to the fragile .035″ wide finger tabs. Maximum efficiency and yield. This example was clipped out of the sheet prior to plating.